Blyth Spartans and North Shields will go head-to-head at the home of Newcastle United in the Northumberland FA Techflow Group Senior Cup Final next week. This year’s game will kick-off at 7.30pm on Wednesday, May 4, at St James’ Park. The first stage of this competition was played in October 2015, with 12 teams taking part – including Newcastle United’s Under-21 side. 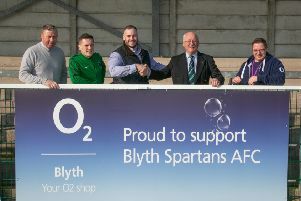 In the semi-finals Blyth Spartans beat Heaton Stannington 6-0 while North Shields earned a hard fought 2-1 victory against FA Vase finalists Morpeth Town. John Ackerley, chief Executive officer at Northumberland FA, said: “We are looking forward to the finale of this year’s Senior Cup competition, which has been incredibly competitive. “Our county cups highlight the calibre of teams in Northumberland, so I would encourage any football enthusiasts to come along and watch this and any of the other finals. General admission to the Techflow Group Senior Cup Final will cost £6, with entry for concessions priced at £3. This county cup final is one of 15 scheduled to be played across Northumberland as the season draws to a close.